New York University / NYU, or locally referred to as NY Jew, is 25% Jewish with about 5,000 Jews on campus. Many of the Yidden at NYU are observant, making this campus ideal for those who keep kosher. On the first floor of the Weinstein Residence Hall at 5 University Place off of E 8th st, is NYU’s Kosher Dining Hall. Anyone can walk into the building, head straight back through the regular cafeteria, and in the back is a decent sized kosher cafeteria. Dairy and Meat meals switch off every day. While most students pay for their meals with meal plans, anyone can purchase a meal, all you can eat I might add, for about $11. Salads, Drinks, and Sandwiches can be ordered daily whether it is a dairy or meat meal. Around the corner from Weinstein Hall, you can find a Crumbs Kosher Bake Shop, at 37 E 8th St. Crumbs is a popular cupcake bakery found throughout the city. 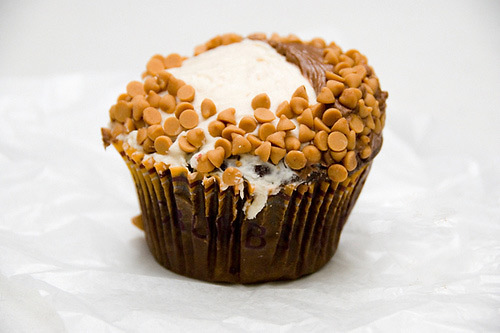 I highly recommend the “Baba Booey”, a chocolate & peanut butter cupcake. Yummm! Closer to Union Square, at 21 East 12th, right off of University Pl., is University Pita, a Middle Eastern Shwarma/Falafel joint. You can order right off the street, or head up the narrow staircase to a tiny eating area. The shwarma, falafel, and laffa are pretty good, and the chumus is homemade. University Pita is open until 11pm, and is also open Motzei Shabbat, which is definitely useful for those heading to Greenwich Village on a Saturday night in the mood for some late night kosher grub. For those of you looking for kosher food near NYU Medical Center (not near NYU’s main campus), there is the NYU Hospital Kosher Cart available, but not much else.